The 14 towers of Meenakshi Amman temple are covered with intricate figurines of gods, demons, and animals. Centuries-old religious traditions infuse every detail in this southern Indian state, from the temples to the trees. A journey through its colorful layers of history reveals an India unlike any other. As a child I assumed that these lines by Edward Lear, England’s 19th-century master of nonsense poetry, described a magical home for the Yonghy, his fantastical protagonist. So it was with a shiver of thrill, as at a spell taking effect, that I landed in Chennai, on India's southeastern shore—the actual Coast of Coromandel. Lear himself visited the city in the 1870s, when it was called Madras. Lear’s primary modes of transportation then were bullock carts and sedan chairs. I was grateful to be riding in a Toyota minivan steered by my driver, S. Jayapaul Sreenevasan, a gentleman of courtly manners dressed entirely in immaculate white, who navigated the roaring capital of the state of Tamil Nadu with a mixture of nerve and verve. The morning rush hour was thick with traffic, crow calls, and the salty air of the Bay of Bengal. 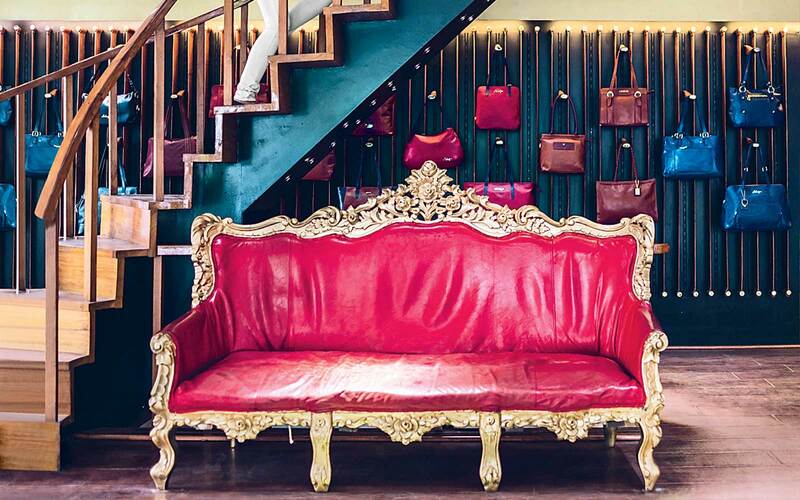 Hidesign, a boutique in Chennai. Tamil Nadu might best be thought of today as a country within a country. Under its charismatic leader, Jayalalithaa Jayaram (who died suddenly last December, plunging the region into political uncertainty), it became one of the stablest and most developed parts of India. Its more than 70 million residents power the third-largest state economy in India, with a gross domestic product of about $130 billion. Yet even as Tamil Nadu has embraced the present, traditional Tamil culture and language, which date back thousands of years, remain vigorously alive. 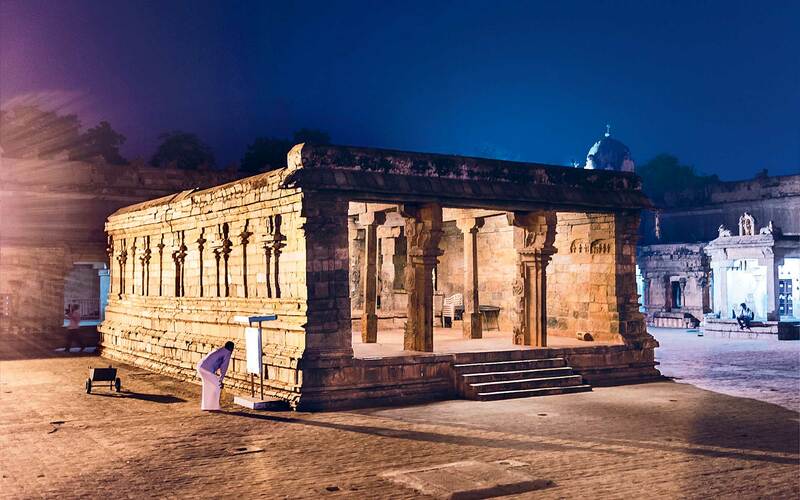 The state’s temples and treasures have long drawn travelers and pilgrims from other parts of India, but they are less familiar to foreign visitors. Because Tamil Nadu has not been as economically reliant on developing a tourism infrastructure as other parts of India, like neighboring Kerala, only now are a number of sleek hotels coming to the state. They provide an ideal way to experience Tamil Nadu’s diverse living history, which includes the monuments of long-ago dynastic rulers, hermetic spiritual practices, and eccentric breakaway communities. From the inscriptions at the burial site of Adichanallur carved in 500 B.C. 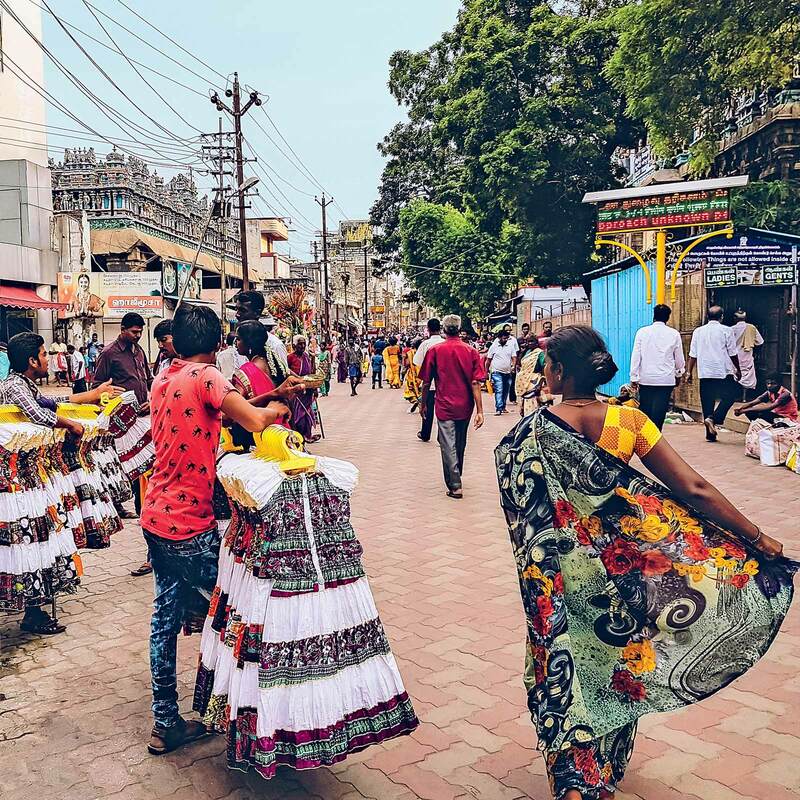 to the great Meenakshi temple at Madurai where mystic rituals are enacted nightly, there is much to discover, even for frequent travelers to India. As we reached the outskirts of Chennai, Sreenevasan pointed out the shining headquarters of several international tech companies. The buildings looked strangely incongruous beside lagoons and marshes where egrets stalked and bent-backed farmers tended rice paddies, just as they had during Lear’s time. Sreenevasan and I drove for several hours through a repeating landscape of rice paddies, palm trees, and little villages until we reached the first treasure of the coast, the beguiling town of Pondicherry. Officially Puducherry since 2006 (though I never heard the new name used), it is a languid and floral place, busy with birds and dragonflies, that still reflects centuries of French rule. This is another of Tamil Nadu’s oddities; while Britain colonized nearly all of India, France maintained a few small enclaves on the Coromandel Coast, including Pondicherry, which it controlled from 1674 until 1954. After independence, some Pondicherrians chose to become French citizens. Today, French is less an influence than a mode de vie. A bronze tribute to Pondicherry’s 18th century governor, grandly dressed in a long coat and riding boots, stands on a plinth by the sea. Like the French street signs, the cuisine of the French Quarter, and the tricolor flying over the consulate of France, it is a symbol of pride in Pondicherry’s unusual heritage. Hawkers selling goods on the street outside Meenakshi Amman temple. My base was La Villa, a delightful hotel in a colonial mansion that has been updated with imaginative architectural flourishes, like a spiral staircase leading up to a pool overlooked by elegant rooms. 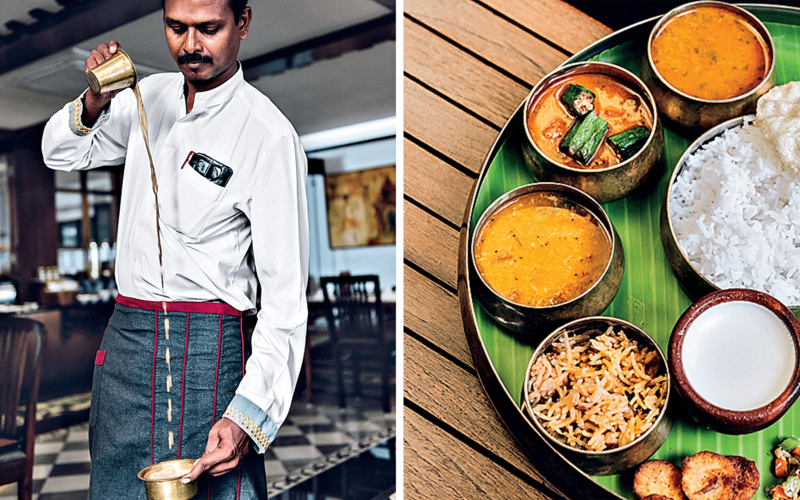 Each evening, I sallied out to join the crowd of flaneurs who stroll Pondicherry’s seafront. We relished the milky-green violence of the Bay of Bengal bursting on the breakwater and the cool of the sea wind. At Le Café, a beach restaurant, students and families drank café au lait and ate dosas while across the road men played boules. They posed with the same meditative hunch, hands behind their backs, that gentlemen throughout France adopt when they fling the steel balls. Between rounds, one spoke briefly to me. As he returned to his game, I pondered the otherworldly atmosphere of the place: the bright colors of the women’s saris glowing against the sea, the melancholy in the fading shades of the boulevards, the absolute ease in the air. It is no coincidence that one of Pondicherry’s industries is spirituality. In 1910, the Indian nationalist, poet, and holy man Sri Aurobindo, fleeing a British arrest warrant for fomenting rebellion, arrived in Pondicherry. Safe within French jurisdiction, he began to preach enlightenment and spiritual evolution through yoga and meditation. Aurobindo and his disciple, Mirra Alfassa, a charismatic Parisian whom he christened “the Mother,” founded the Sri Aurobindo Ashram in Pondicherry in 1926. Pilgrims were drawn by Aurobindo’s belief that oneness with the divine does not mean renouncing the world but “turning the will away from motives of self-interest to the truth and the service of a greater reality than the ego,” as he wrote in his memoir. Today, the ashram provides food and shelter to hundreds and guides the lives of thousands. Its headquarters, library, cafeteria, publishing operation, embroidery business, post office, and stores are housed in colonial buildings clustered in the northern part of Pondicherry’s French Quarter. A few miles north of Pondicherry lies Auroville, the utopian community Alfassa founded in 1968, when she was 90, in what was then arid scrubland. Calling it “the city of the dawn,” she conceived Auroville as a town devoted to new ways of living: cashless, international, dedicated to peace and spiritual harmony. Today, it occupies more than 2,000 acres, accommodating 2,000 people from 43 countries who live together under the canopy of the 2 million trees they have planted. Aurovilians run businesses in fields ranging from technology to textiles. The campus’s focal point is the Matrimandir, a meditation space inside a structure that resembles a giant golden golf ball on an immaculate fairway. 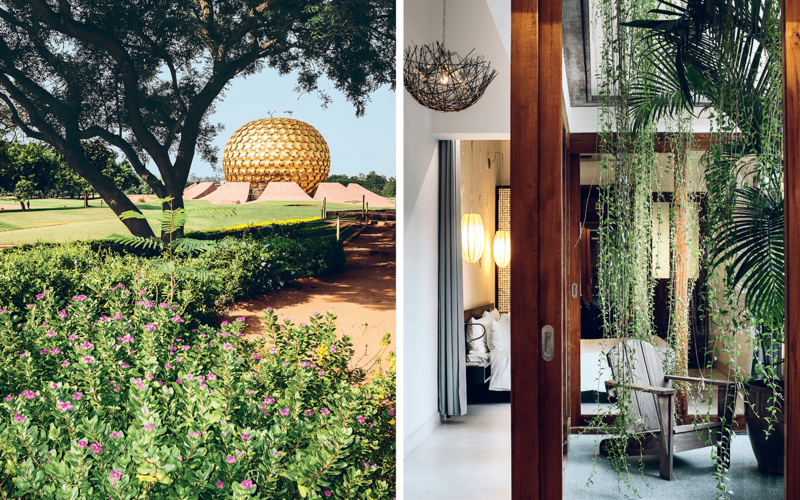 Visitors are welcome to stay at Auroville, attend courses, volunteer their labor, join a yoga session, or book meditation time in the Matrimandir. Left: The meditation center at Auroville, near Pondicherry. Right: La Villa, a hotel in a former colonial mansion in Pondicherry. In her linen shirt, a Maori pendant symbolizing friendship hanging around her neck, Marlyse radiated enthusiasm for her new life. “I just want to contribute to this endeavor,” she said. “Auroville makes it easy if you have a dream.” She is part of a team developing electric transportation for the community, funding a portion of the enterprise from her own savings. Upon arrival she was “horrified,” she said, by all the motorbikes. When not devoting herself to that project, Marlyse works behind the information desk and on the website. She is being assessed by her fellow Aurovilians, who will decide if she has the personal qualities and work ethic to stay on as a full member of the community. Around us young people consulted their laptops. Belief in the teachings of the Mother and Aurobindo is no longer required, Marlyse explained— “but you have to work. Community members work six days a week.” The atmosphere was one of quiet excitement, industrious and dedicated to something beyond personal advancement. The following evening I found myself in the city of Thanjavur on the back of a moped, weaving terrifyingly through traffic like a pebble in an avalanche. My driver, the impish and charismatic K. T. Raja, beeped his horn constantly, never looking right, left, or behind, navigating by instinct and faith. As the city swept past, I thought of Lear again: “Violent and amazing delight at the wonderful variety of life and dress here.” The serenity of Auroville felt far away. In the morning, Raja, a “Tourist Guide Government Trained,” as his badge stated, continued my education in the story of Thanjavur. The city was the capital of the medieval Chola dynasty, which 1,000 years ago spread across southern India, northern Sri Lanka, and the Maldives. We walked around Brihadisvara, the mighty temple completed by King Rajaraja I in the year 1010, admiring its signature feature, a soaring orange granite tower decorated with thousands of figures, niches, and cornices. We joined a line of devotees to Shiva that has formed every day for centuries. We advanced past carved pillars into the heart of the shrine, where a priest raised a pyramid of fire composed of small candles. The crowd’s shouts made the room ring with supplication. 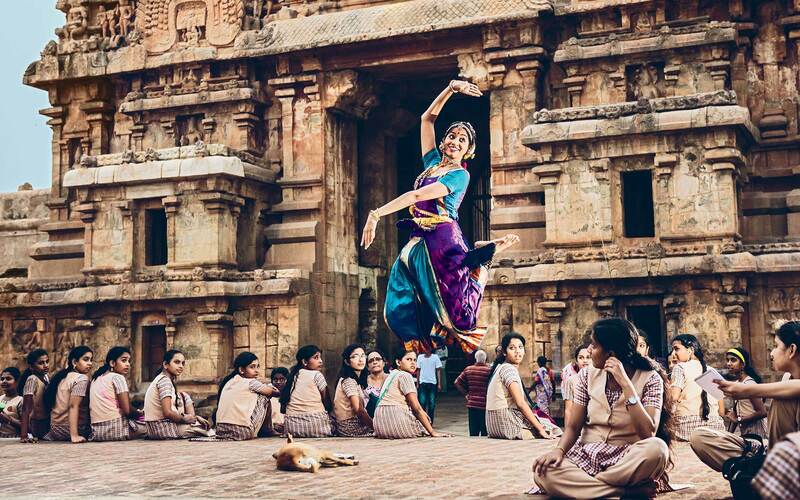 A performance of bharata natyam, a form of classical Indian dance, outside Brihadisvara Temple. “Temples meant employment,” Raja told me. “If people have employment and food, there is dance, sculpture, painting.” Parakeets and swifts flew over the great walls and around the tower’s 80-ton capstone—raised, Raja said, by elephants who conveyed it along a great earthen ramp that went all the way to the top. We studied a huge carving of Nandi, Shiva’s sacred bull, that dates to the 16th century. Nearby, there were sculptures of Shiva that seemed to have four arms and four legs. These were both devotional and instructional, Raja explained, depicting the deity striking two poses at the same time. Inside the Royal Palace, now a museum, he showed me astonishing 11th-century bronze sculptures of Shiva and his beautiful consort Parvati, the goddess of fertility, love, and devotion. Their detailed necklaces and bracelets all but jangled with the swelling movements of their muscles. Left: The “meter coffee” at Svatma. Right: a vegetarian thali lunch at Svatma. Afterward, I returned to Svatma, a new hotel in an old merchant’s mansion in a quiet quadrant of Thanjavur. Its philosophy is predicated on the relationship between a healthy body and a quiet mind. The restaurant is “pure,” my waiter informed me, meaning it serves vegetables only. At the beginning of each sumptuous meal, he displayed a tray of onions, peppers, eggplants, potatoes, and spices, like a conjurer challenging the diner to imagine how the chef could possibly transform such mundane fare into the delectable curries and sauces he would soon serve. South of Thanjavur, the landscape becomes drier and less populated. A granite cliff rears above the plain. I had reached a zone of India’s lesser known and more mysterious faiths. One is Jainism, founded in the sixth century B.C. by Mahavira, a companion of Buddha. Meditation, fasting, and the rejection of any action that might harm another living creature, Jains believe, lead to the liberation of the soul. Sreenevasan turned off the road so that we could visit the Sittannavasal Cave Temple, an eight-foot cube hewn out of the cliff in the seventh century by Jain craftsmen. Inside were carved Buddha-like figures called tirthankaras and glowing murals depicting religious figures, swans, and lotus flowers. We stood in the middle and hummed. The stone took up the sound. It lingered even after we fell silent. We could feel it pulsing through the rock that surrounded us. Farther along the road, in the isolated village of Namunasamudram, hundreds of terra-cotta horses lined the path to a shrine. These were artifacts of the Aiyanar faith, an egalitarian offshoot of Hinduism that recognizes worshippers of all castes and religions equally. The fierce watchfulness of the horses combined with the eerie silence of the shrine gave me a prickly feeling on the back of my neck. “Keep away from the horses,” Sreenevasan said. “There are snakes.” Inside the shrine we found drapes and colored pigments that had been left recently, but no sign of anyone—only the feeling of being observed while standing on holy ground. Inside the Brihadisvara Temple complex, in Thanjavur. The sensation of falling through a crack in modernity only deepened upon our arrival in the Chettinad region. A Hindu merchant class organized in a clan structure, the Chettiars established themselves in the 17th century, likely through the salt trade. Their heyday came late in the 19th century when they began borrowing money from British colonial banks and lending it to small traders at a higher interest rate. The fortunes they made allowed them to finance the construction of thousands of palatial houses, many in the Art Deco style, arranged in a spray of planned villages. The Parisian architect Bernard Dragon, who explained Chettiar history to me, has renovated one of the mansions and now runs it as a dreamy hotel called Saratha Vilas. Built in 1910, it is a succession of halls and courtyards in Italian marble, English ceramic tiles, and Burmese teak, all arranged according to the principles of vastu shastra, the Hindu philosophy of architectural harmony. Many of the surrounding mansions are shuttered and decaying. Dragon and his partner are leading the effort to conserve them, chronicling their many marvels and applying, on behalf of the Tamil Nadu government, to UNESCO for protected status. In the village of Athangudi, at Lakshmi House—named for the goddess who was a patron of wealth, a Chettiar favorite—the entrance is guarded by statues of British colonial soldiers with rifles and pith helmets, a testament to a mutually beneficial relationship. Later, I walked the lanes of the village of Pallathur, delighting in the architectural symphony of the big houses and the long Italianate barns, the parakeets and swallows overhead, and the egrets flocking from the rice fields in ragged skeins. Because these narrow roads have little motorized traffic, the soundscape remains what it was a century ago: bird song, bicycle bells, and distant conversation. Everyone I met in Tamil Nadu, from drivers to businesswomen, carried the stories of the gods’ relationships and squabbles like a shared and universal soap opera. The great temples are where they go to see those stories enacted, and no temple is greater than Meenakshi Amman in Madurai, one of the oldest continuously inhabited cities in India. The temple is mentioned in the letters of Megasthenes, a Greek ambassador of the third century B.C., by which time it would have been about 300 years old. The bulk of the complex, though, was built in the 17th century by Thirumalai Naicker, a ruler of the Nayak dynasty and a patron of the arts. Meenakshi remains the spiritual heart of Madurai, drawing pilgrims from across the subcontinent. It is a 16-acre city within a city, protected by 14 looming towers that writhe with intricately painted figurines. Because much of the site is roofed over, walking inside is like entering a subterranean citadel. After dark, when the hot moon glows through the night haze, visitors jostle at the gates. Fifteen thousand are said to come every day, but the space inside is so vast that there is no crush. I walked high corridors between stone beasts, becoming unmoored in time. There were no windows. The stone was hot underfoot. The smells were floral, sour, sweet. I heard bells, chanting, voices. Men prayed prostrate, as if swimming on the slabs. Tapers flickered, wax dripped. Statues were adorned with garlands, oil, vermilion, and mysterious chalk marks. Here was Kali, the destroyer, draped in offerings, her feet encrusted with powders. There was a sense of fearful powers held in check, appeased and placated. Left: Meenakshi Amman temple, in Madurai. Right: Roses and madurai malli, a local variant of jasmine, at Svatma, a hotel in Thanjavur. A small crowd watched a procession that has taken place nightly since the 17th century. First came cymbals, drums, and a horn, and then, led by two men bearing flaming tridents, a little palanquin, silver and curtained, borne by four priests from the shrine of Shiva. With great solemnity, the priests conveyed it down passages and around corners to the shrine of Parvati. They were bringing the two lovers together. They set the palanquin down before the gates of the shrine while the band played a lively, dancing rhythm (two students swayed along, filming on their phones), then fumigated it with clouds of incense. The crowd pressed toward one of the priests, who anointed their foreheads with gray ash. He prepared an offering of sandalwood paste, jasmine, and herbs, then lit it on fire. The crowd raised a great shout and a trumpet called. Then the priests shouldered the palanquin again, and took Shiva inside Parvati’s shrine. There was a marveling, uplifted feeling among the crowd, and we smiled at one another. Though I had been observing and taking notes, I did not now feel separate from what I had witnessed, but part of it, as if I, too, had played a role in putting the gods to bed. Tamil Nadu has this effect: you arrive an outsider, only to find yourself a participant. 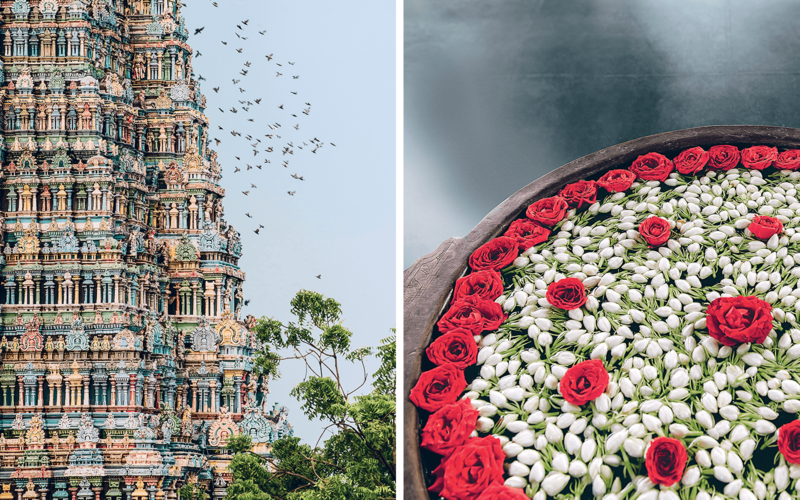 Our Personal Guest This New York City–based operator offers a Tamil Nadu itinerary with stops in Chennai, Pondicherry, Madurai, and Thanjavur. All lodging, transfers, guides, and entry fees are included. ourpersonalguest.com; 12 nights from $7,878, for two. Gateway Hotel Pasumalai This colonial manor is surrounded by gardens and offers views of the Pasumalai hills. Madurai; doubles from $80. La Villa Hotel A charming colonial house with six suites, a rooftop pool, and an excellent menu. Pondicherry; doubles from $180. Saratha Vilas An exquisite Chettiar mansion with cool, comfortable rooms, beautiful food, and a contemplative atmosphere. sarathavilas.com; Chettinad; doubles from $125. Svatma This large, refurbished estate has an excellent vegetarian restaurant and spa. Try the detox massage, which ends in a honey, milk, and coconut scrub. svatma.in; Thanjavur; doubles from $215. Pondicherry Museum This acclaimed institution is filled with collections of coins, bronzes, ceramics, and French-colonial artifacts. St. Louis St., Pondicherry. Temple Visits Entrance to Brihadisvara, Meenakshi Amman, and other sites is free, but you may be asked to pay for shoe storage.